Helping to protect YOU, our customers and our community. NECA-IBEW Electricians upholds the highest standards when it comes to our contractors, their employees and substance abuse. It has been proven time and time again that a drug-free workplace promises increased productivity, greater efficiencies, fewer and less severe jobsite accidents and a reduction in theft, which drives cost savings in workers’ compensation and the bottom-line. 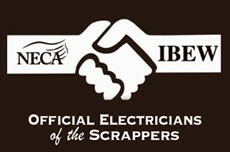 Every NECA-IBEW Electricians contractor is required to cooperate with the Bureau of Workers’ Compensation and enforce the standards of our Drug Free Work Place Program, which is an incentive-based program that assists contractors in establishing a safer and substance-free workplace. The program administers drug tests that are free of charge to employees and are designed to help employers detect and deter substance use and misuse. Other program requirements include: employee education, supervisor training, a written substance abuse policy, drug and alcohol testing; and employee assistance. Substance users are up to 50% less productive. Substance users are on average absent three weeks or more per year. Substance users are tardy three times more often than non-users. Substance users are three to four times more likely to have an accident on the job. Substance users are five times more likely to file a workers’ compensation claim. Up to 80% of all theft and loss are due to substance-using employees. • Decreased severity of accidents. • Reduction in use of workers’ compensation.